Started – November/2007 with about 12 people attending. Approximately 35 people have joined us at our monthly meetings, which are the fourth Wednesday of each month. These are held in Council Chambers at The B.A.Municipal Building at 7:00 p.m. Working closely with – Local businesses, Optimists and Council. A new “Welcome to Alvinston” sign on the south of end of River Street. Incentive to encourage external improvements, we organize “Spruce Up” event. Random Ballots are drawn and each winner receives $50.00. Sponsor 2 Flower Hanging Baskets each year. 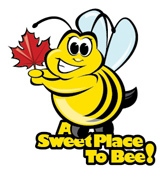 Had Bee logo produced as temporary tattoos to be given away at local events . Organized and conducted the multiple Alvinston Business Survey to identify future needs. Develop the green space into a small park .Looking for small gardens, benches, tables, etc. As a fundraiser have worked at the large item drop off and were in charge of the tire recycling area. Have sold flower bulbs both as a way to help bring pride to a home but also as a fundraiser over a 3 year period. at the Gazebo and Alvinston Community Park. planted, sidewalk leading to Gazebo and installation of a recycling /waste disposal unit. landscaping was completed around him. Looking for a way to contact people who may need help with their own property, but are unable to do things themselves. Continuing to update a booklet listing all businesses & their phone numbers, local events, emergency numbers, etc. donations in the evening for fireworks during Canada Day Celebrations. Participates in both the Fall Fair and Christmas Parades with our floats. Holds a yard/garage sale each year with the support of donations from the Community. Design, built and maintained gardens for the area around the Gazebo. Municipal contributions – operating grant for community projects, signage and labour/equipment assistance with Sports Park. Annual yard/ garage sale in May. Everyone is welcome to attend our meetings. The more ideas we have, the better Alvinston can become! Please support us in any way you can – time, money, ideas, connections – we will certainly appreciate it all.